One of the many things I admire in Korea is the effort of the government to improve their public parks. I have been to a lot of parks in Korea and each one has utilities installed for everyone to enjoy like hiking, picnicking, biking and even just for a small talk with a group of friends. 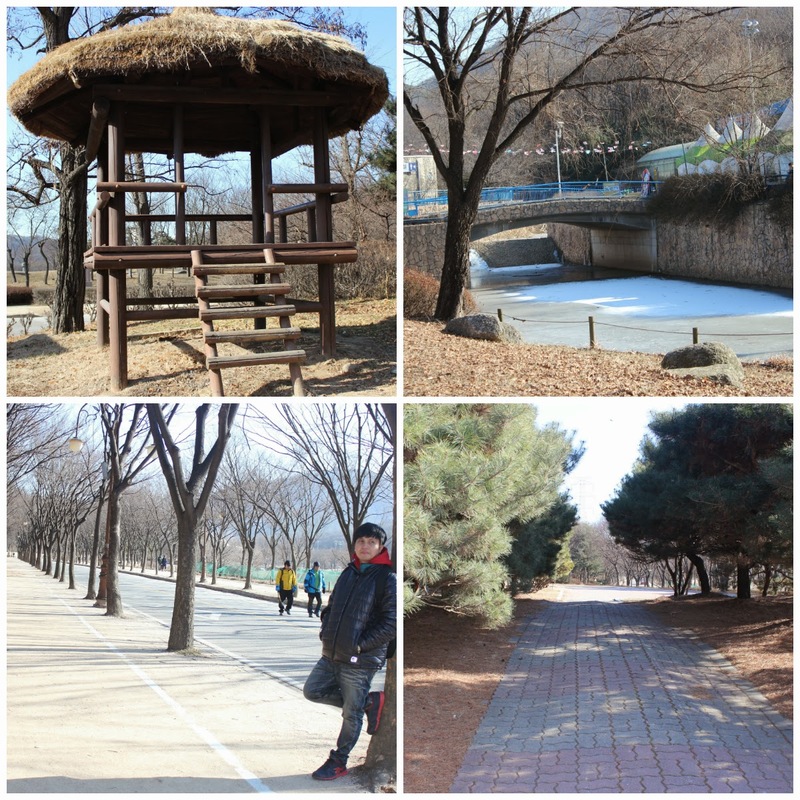 The Incheon Grand Park is one of the many public parks in Korea where people can just go and enjoy the sceneries and even sled during the winter time. It is located in Namdong-gu in Incheon Metropolitan City and it offers a lot of breathtaking sights and various services that entertain people and it is also a good venue for families and friends to bond together. There are activities held in this place every season. During spring time, you will be amazed by the beautiful presence of Sakura or Cherry Blossoms. During summer, you can enjoy the rose festival and during winter, an inline skating ring is installed in the park for sledding. You can go and enjoy at Incheon Grand Park at any season of the year. 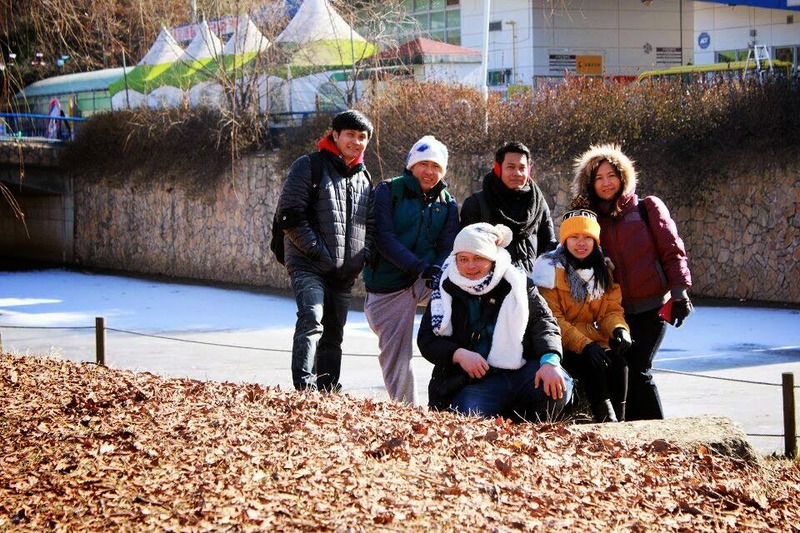 The Global Filipino Investors (TGFI)- Korea ,went to Incheon Grand Park during the peak of the winter season to try sledding at their inline skating ring. It was also a great opportunity for us to talk about finances and money matters especially that it was the first day of the year 2015. The place is so huge that we have to walk about 500 meters from the entrance to reach the sledding area. However, we didn't mind it because doing that is just like "a walk in the park", literally. There are a lot of attractive things to see in the park and it is so perfect for people who want to relax and jog. Since we went there by group, we found it a perfect spot to talk some serious matters without compromising the fun. We talked a lot about insurance, stock market, mutual funds, business and anything related to personal finance while we enjoy the view. I think it was my first time to really learn something from the conversation while walking in the park and enjoying the attractions that the park can offer. Whatever topic we discussed while walking in the alleys of Incheon Grand Park, it became more interesting with the views of different themed parks inside. Yes, parks inside a park! That's how huge it is. There's rock, rose, sculpture, wild plant garden and whatnot. All these and other attractions like Children's zoo, a huge botanical garden and a forest area, take that!.... There's so much to enjoy at Incheon Grand Park. But of course, the most amazing part of the park and the most visited area during winter is the skating ring where you can sled all you want for a very cheap cost of only 7,000 won. When I saw the skating ring, I was so terrified at first because it looks dangerous. I saw some kids sledding on the slope and I saw them coming out from the ring just fine, so I decided to try it at once for the sake of experience. At first, it was indeed intimidating, but when you get the hang of it, you will repeat it again and again. I guess I like sledding more than skiing. I tried to ski last year and it was so difficult because I always stumbled. In my book, sledding is more fun and easy than snowboarding and skiing. Also, expect that the place is congested especially during the peak of winter season. 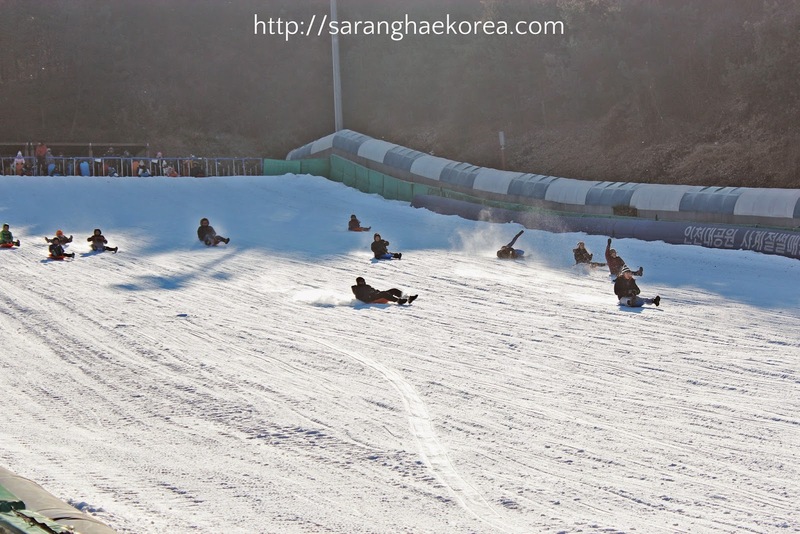 There are not so much to do during winter season except for sledding, but don't worry, they are so organized at Incheon Grand Park and everybody will have their fair share of sliding over the slope. You just need to have patience and you also need to bundle yourself up because it is really freezing out there. The park is open every day. During summer season, it is open from 5 am to 11 pm while during winter season, it is open from 5 am to 10 pm. The Botanical garden and the Children's zoo is open from 9 am to 6 pm and closed every Monday. The entrance to Incheon Grand Park is free but some attractions charged a very small fee. The easiest way to go to Incheon Grand Park is through the subway. Take Subway Line Number 1 and get off at Songnae Station. Go to Exit Number 1 and walk straight about 30 meters to the bus stop. Take Bus Number 909, Incheon Grand Park is two stops away from Songnae Station. A single park with different attractions and special services dedicated for every season, Incheon Grand Park is indeed a one stop venue for leisure. For those who want to go out and try sledding on winter, or see cherry blossoms during spring and smell the beautiful roses every summer, Incheon Grand Park is a must place to visit. I love snow tubing/sledding. What a fun time you guys had. I think I might take my kids this weekend actually! That looks like a great place to visit! I'd love to be able to go there someday. Sledding there looks so much fun! It reminds me of the parks in Japan, but I have to say that Incheon Grand Park has attractions unique to other parks that I've heard of and been to. I would really love to try sledding - looks super fun! This looks like a really great park. Sledding looks like a lot of fun. I would love to go sledding one day. That sledding looks like a lot of fun, I would love to give it a try. So much fun! I love sledding. Looks so fun. I'd love to visit in korea thanks for this blog. This park looks awesome! I wish they had parks like this in Canada. I haven't been sledding in years! I'm planning to visit Korea this year. Hoping to try these things when I visit! kaya nga bro eh... it's ok, next time we meet, exchanging of ideas pa rin..
We just got some snow today. Not enough to go sledding, but enough to make me want to. :) Your pictures are great! If we would have been in Korea, we surely would check the place out. That is such a nice place and there's no doubt it's fun to be there. What an awesome park! That sledding hill looks super fun! That looks like SO much fun! What an awesome time! Namiss ko to. Hope to join you, guys, next time. That looks like so much fun. I can't remember the last time I went sledding down a hill like that! What great fun! I would so love to visit Incheon! My sister was there last year and LOVED it! Wow what great fun! Looks like you guys had a blast! I love the sledding photo, makes me miss when I used to go skiing and tubing! Sledding there looks like so much fun!! My husband (formerly based in HK) mentioned how much fun he had going boarding in korea and japan... Looks like there's plenty of fun snow activities to be had there! Sounds awesome. Seems to be a great place to visit. I love Sledding as it has lots of fun & so energetic as well. These pictures looks fabulous. Love this share. I don't know if the Incheon airport is public or private, but I was just there in November. It was really nice, modern and easy to navigate, even for us foreigners! I was disappointed that my layover wasn't quite long enough to get out and explore a little. That sledding hill looks fantastic. I have not been sledding in a long time. It sounds like the part has other fun stuff to do as well. I like that there is no admission fee. I have never seen snow before so I am so jealous! I would love to try sledding since it seems so fun. The sledding looks like a lot of fun even though I'm not a fan of winter sports. I do enjoy walks through beautiful parks though. I wish I will be able to visit the place in the future - never been there before. How fun! I haven't spent the day at the park in ages! This is great motivation to find a local park to support.